Before I get started on this week's Fresh Fitted, I feel obligated to offer hearty congratulations to the Boston Red Sox on their 2013 World Series championship. It's too difficult for a New York City resident to actively root for a Boston team, but in light of the Boston Marathon bombing earlier in the year my thought is that losing the World Series would have been an especially hard pill to swallow for Red Sox Nation. My only positive spin on this victory is that the New York Yankees will undoubtedly feel extra pressure to dominate the AL East next year. 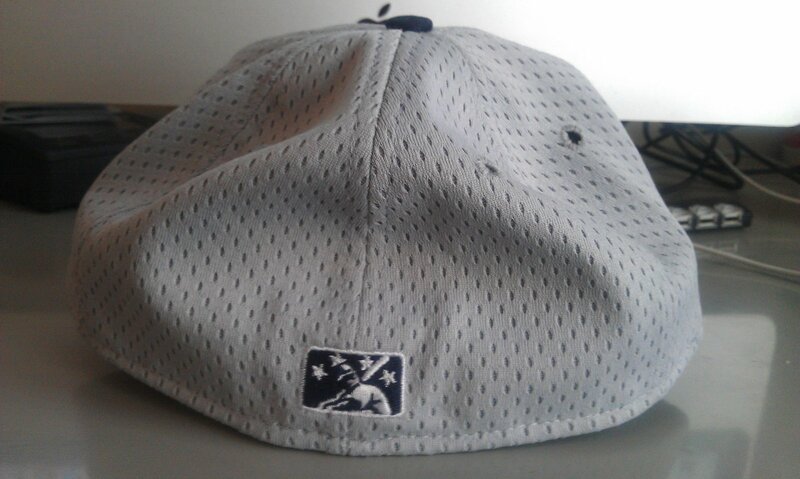 In light of all this, I deemed it appropriate that the first post of the off-season should showcase a rare cap from one of my favorite former Yankees farm teams: the Columbus Clippers. I have always had a soft-spot in my heart for navy-blue caps with nautical-theme logo but the light gray color here gives it this other sort of "military" quality. 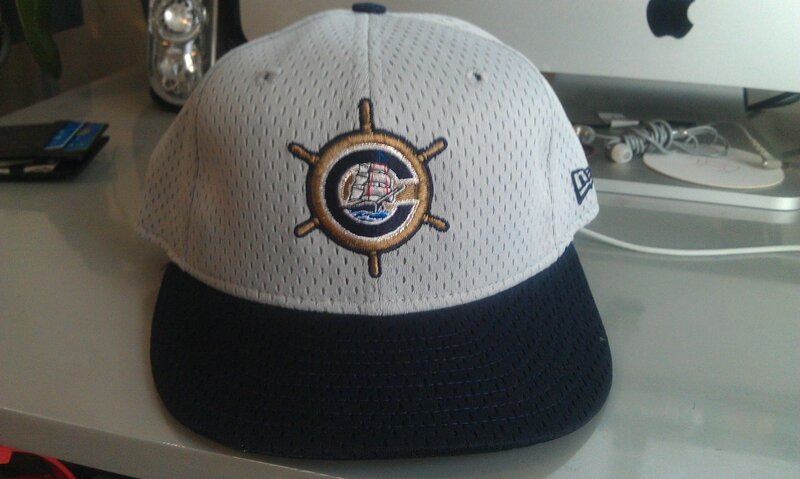 My favorite part of the cap is the helm that envelops the "C" and ship in the logo. You up the ante on a cap's value any time you throw in more aquatic life imagery! 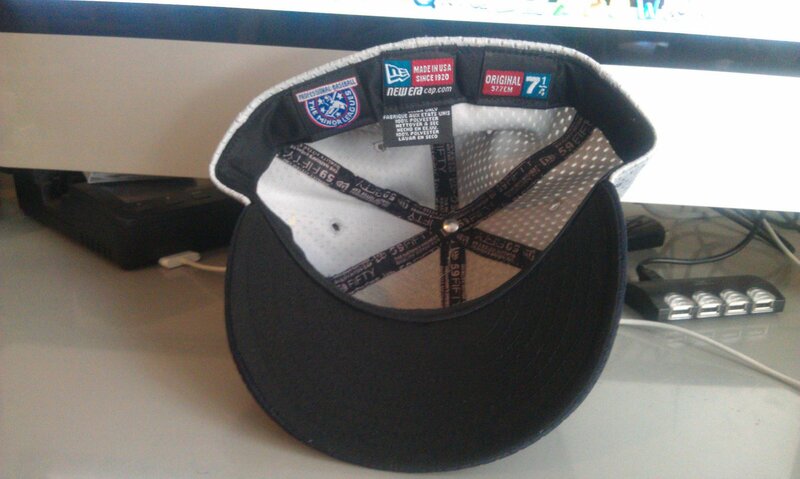 The polyester mesh material makes this a great cap to wear in different types of weather. This cap is made to get beat up a little so I don't mind if it accidentally gets worn in the rain or if it gets a little sweat-soaked during a run or a workout. The interior is lined with a black sweatband which is key if you want to trick yourself into thinking that your cap is cleaner than it really is! I haven't been able to track down any photos or cards of players who wore this cap so it's hard to assess what season(s) this cap was worn. 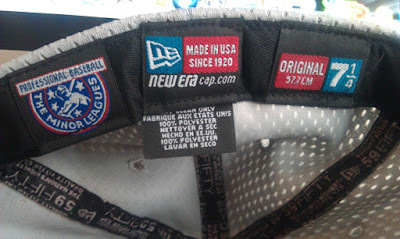 The biggest tell on this cap is the "59Fifty" panel lining so I compared it to commemorative caps with year-specific All-Star Game and World Series patches. This type of panel lining -which I like to call the "messy version"- is found on a 2000 World Series Yankees cap as well as a 2001 All-Star Game cap. Looking at a1999 World Series cap and a 2002 World Series cap tells me that this "messy" lining was only around for the 2000 and 2001 seasons so I'd have to say this cap is from one of those two seasons. I hope enjoy the pictures of this cap as much as I enjoy wearing it. I'll leave you with a fun video of web-series I enjoy a lot: Yacht Rock! Hi Anthony, that card sounds like a real gem but unfortunately I've never even seen or heard of it! Hopefully someone out there who stumbles upon this page sees your comment and can help you out! That's what the point of this blog is, really; helping to bring baseball addicts around the world closer together. Cheers! Yomiuri Giants - Fresh Fitted Friday!!! !